The fence has deteriorated. Livestock roam at will. The cemetery is long forgotten. 7. Susie Woodall 1831 - 1883 "I am the mother of these three dear boys lying by my side"
On page 63, the book shows pictures of two gravestones - Abraham Woodall and Susie Woodall. 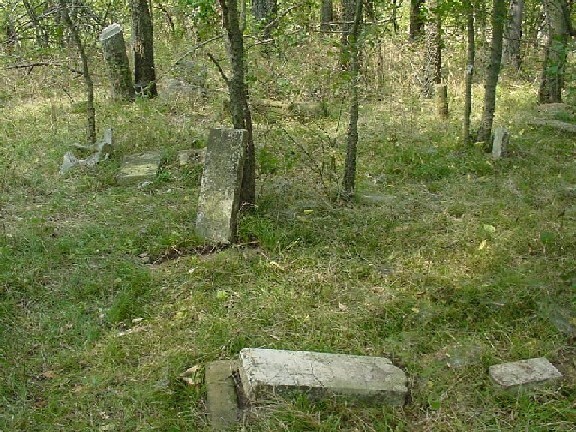 Both gravestones were broken and laying on the ground. Frank Williamson and I have been wanting to find this cemetery for a couple of years. 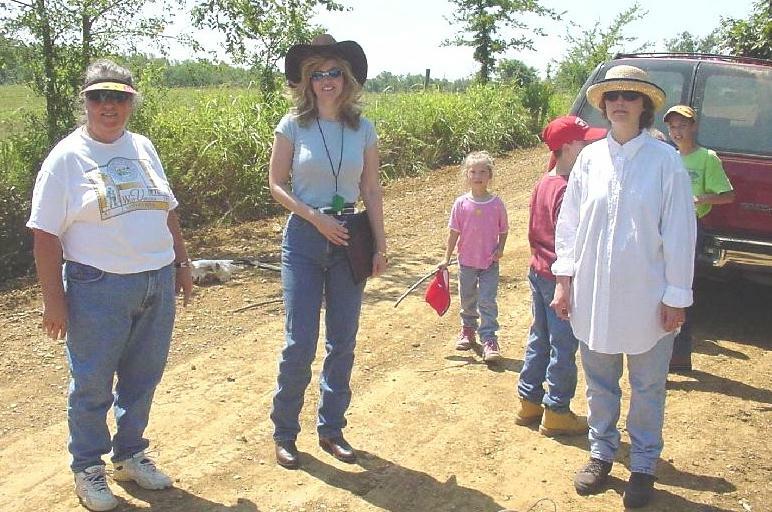 My wife and I, my brother David Ridenour and family, Frank and Sharon Williamson, set out to find it on July 20, 2002. Warner is north of I-40 and Highway 2. The cemetery is close to a river called George's Fork. 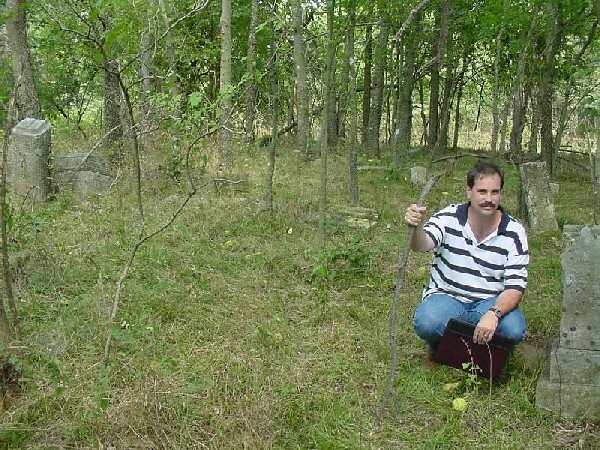 We think we found the area where the cemetery used to be. My brother found a couple of wooden poles that could have been part of the fence or gate. He also found two antique rose bushes that were line up perfectly a few yards apart. The area seemed to be rectangular shaped as the book indicates. However, we did not find one single gravestone. Perhaps the water from the river and fallen trees destroyed the stones. They may be buried under the debris. None of the dirt roads had signs. However, it was easy to find. We are not 100% sure we were on the correct road that is closest to the cemetery, since it was all grass. 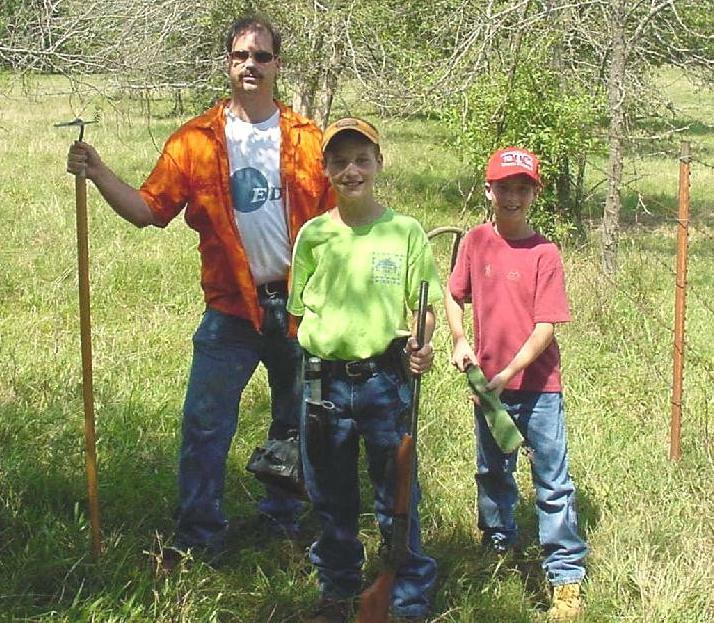 On 7/23/2002, my brother David put in the latitude and longitude coordinates at a GPS website and he now believes that we may have been 100-200 yards east of the cemetery. After the two pictures below, I will discuss the next time we went looking for it using a GPS device. 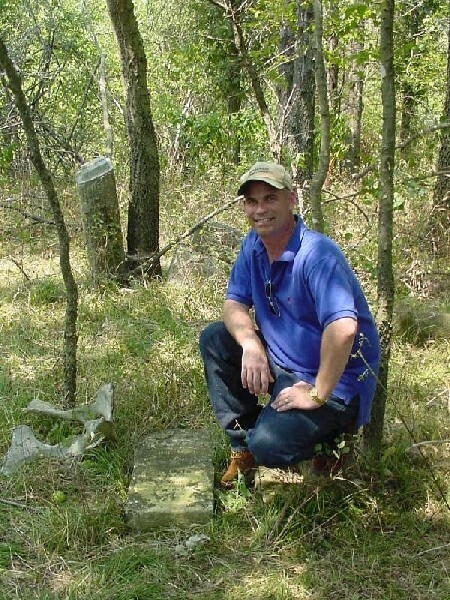 On 8/11/2002, my brother David and I went back out to try and find the cemetery. We met Sue Tolbert, her son Skye, and George Miller. 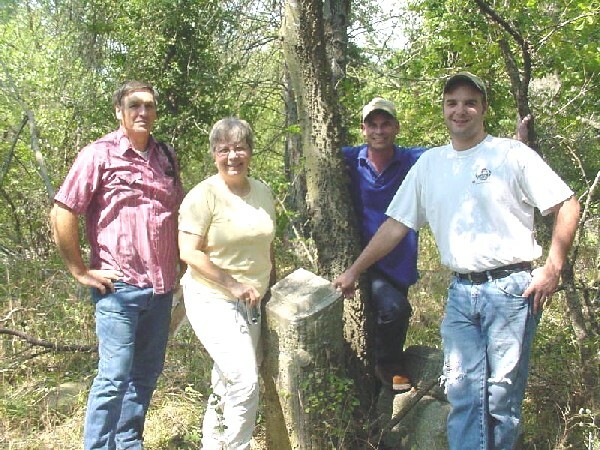 Sue and George both work for societies (see bottom of page) that search for lost cemeteries in Muskogee County. Sue had a GPS device and we found the cemetery (Latitude 352739N Longitude 0951548W). It was about 100-200 yards west of where we were the first time. 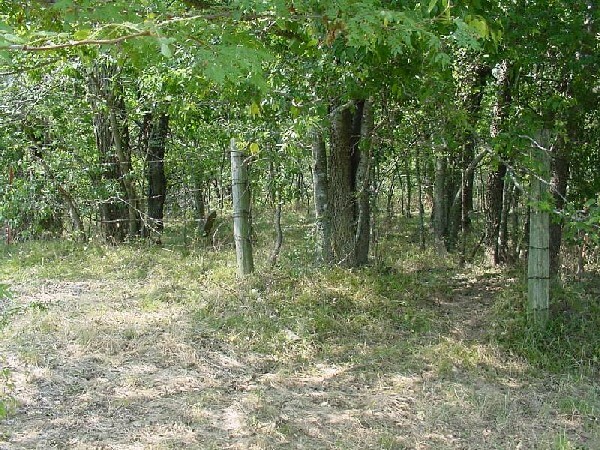 It was on a hill and covered in trees inside a dilapidated barbed-wire fence. I discovered that the Susie Woodall I was looking for was not Susannah (Watie) Woodall. Susannah Watie married Charles Moore Woodall. 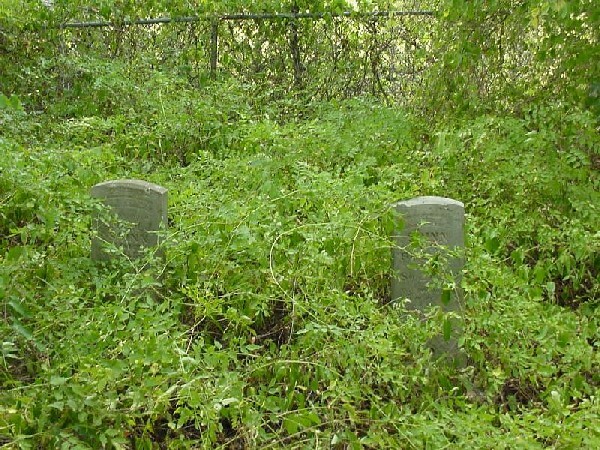 The Susie Woodall buried at the cemetery was the wife of Abraham Woodall, who is buried next to her. Note: Upon further research using Emmet Starr's book, Abraham Woodall was part of the 2nd Cherokee Mounted Volunteers organized under Col. William Penn Adair. He was a Senator from the Canadian District in 1883. Abraham was also a judge of the Canadian District in 1871, 1873, 1875, 1877, 1879, and 1881 (maybe those were election years with two-year terms). On page 345 and 465, his wife is Susannah Hendricks. 5. Charlie F. Woodall b. 12/8/1882 - d. 3/12/1883 Aged 3 Mos. & 4 Days. 7. Susie Woodall Wife of A L Woodall (**b. 1831) Died 4/20/1883 Aged 52 Years "I am the mother of these three dear boys lying here by my side." 10. Nina E. Fields Dau. of W. G. and Ella E. b. 8/8/1880 - d. 12/7/1890 Aged 10 ys. 3 ms 29 Days. George Miller is president of the Webbers Falls Historical Society. Sue Tolbert is vice-president of Muskogee County Genealogical Society. Her websites are affiliated with the American Local History Network (ALHN); the American History and Genealogy Project (AHGP) and Saving Graves, all hosted by USGenNet. She is a member of the Oklahoma Genealogical Society, the National Genealogical Society, and the Muskogee County Genealogical Society. She is also the webmaster or co-webmaster for Muskogee County, Sequoyah County, and Okmulgee County OKGenWeb Archives; OKLawmen and Outlaws; OKVeterans pages; and co-webmaster for the ILGenWeb Shelby County IL. site. 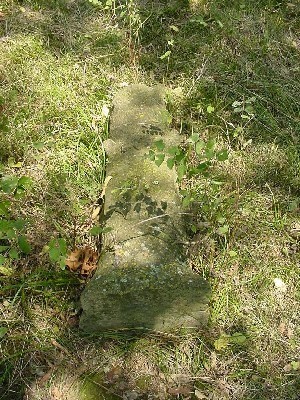 Sue Tolbert also wanted to find and record those buried at the Howland Cemetery, which was very close to where we were. We found the cemetery covered in honeysuckle and enclosed in a chain-linked fence. 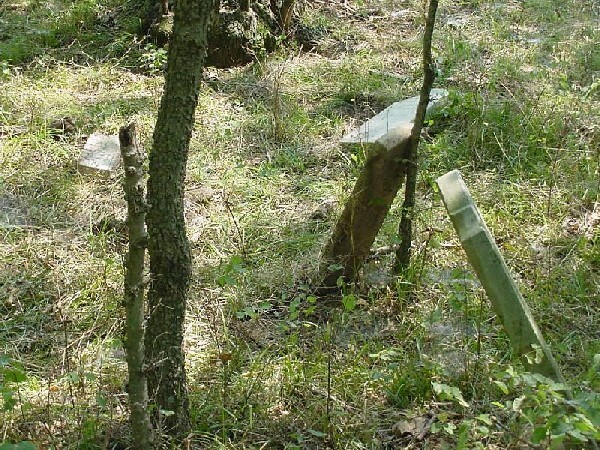 We found and documented eleven Shinn and Howland graves. Susan E. Howland Rogers 1886 - 1944 - daughter of Erastus and Susan Elizabeth. In May of 2010, Roberta Shinn Harris email said that Erastus' wife Susan Elizabeth Rider Howland is buried to the left of him but this is no marker for her.